Fraud Hotline, LLC proudly joins November 3 - 9, 2013 campaign to raise awareness of the need to safeguard small businesses and not-for-profit organizations from internal fraud and embezzlement. 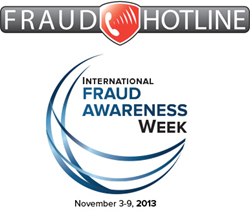 Fraud Hotline, LLC, a national provider of anonymous and confidential reporting services, announced that it will be participating in International Fraud Awareness Week, November 3 - 9, 2013, as an official supporter to promote anti-fraud awareness and prevention. The movement raises awareness of the need to proactively fight and help safeguard small businesses and not-for-profit organizations from the growing problem of internal fraud and embezzlement. During Fraud Week, Fraud Hotline, LLC encourages organizations to visit their website for basic resources on improving internal controls, information related to preventing and detecting fraud within your organization, and recent news articles on embezzlement. In addition, any small business or not-for-profit organization registering for Fraud Hotline, LLC services during Fraud Week will automatically receive a discount of 20% off their annual fee. “An anonymous and confidential hotline not only conveys the appropriate “tone-at-the-top”, but also serves as a best practice by enhancing whistle-blower policies and discouraging unwanted behavior.” states Fraud Hotline, LLC Managing Member, Travis J. Wilson, CPA, CFP®. Fraud schemes are extremely costly. The median loss caused by the occupational fraud cases in the study was $140,000. More than one-fifth of the frauds involved losses of at least $1 million and lasted a median of 18 months before being caught. Small businesses and not-for-profit organizations are especially vulnerable to occupational fraud. These organizations are typically lacking in anti-fraud controls compared to their larger counterparts, which makes them particularly vulnerable to fraud. For more information about increasing awareness and reducing the risk of fraud during International Fraud Awareness Week, please visit http://www.FRAUDHL.com or http://www.FraudWeek.com. Fraud Hotline, LLC is a national provider of anonymous and confidential reporting services to small businesses and not-for-profit organizations. Employees, volunteers, board members, and others within a registered organization may submit reports of potential fraud, ethical issues, and other concerns 24-hours a day using a secure online form or toll-free telephone number.